You need a garage, but you don’t want to spend weeks building your own – or spend a small fortune hiring someone to build it for you. 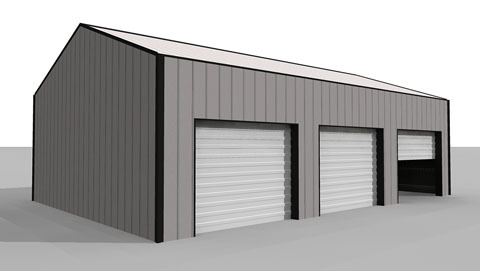 A pole barn kit will allow you to quickly and easily assemble your garage while enjoying the durability benefits these buildings offer. Deciding to build a pole barn garage is the first (and easiest) step. You may not know how to begin, or what to even look for when selecting a kit. There are many benefits to choosing a pole barn garage over its stick-built counterpart. Unlike conventional stick-build garages, which require a foundation, pole barn garages only require deep post holes to secure the vertical beams. This method not only saves time, but also saves on labor, concrete and excavation. 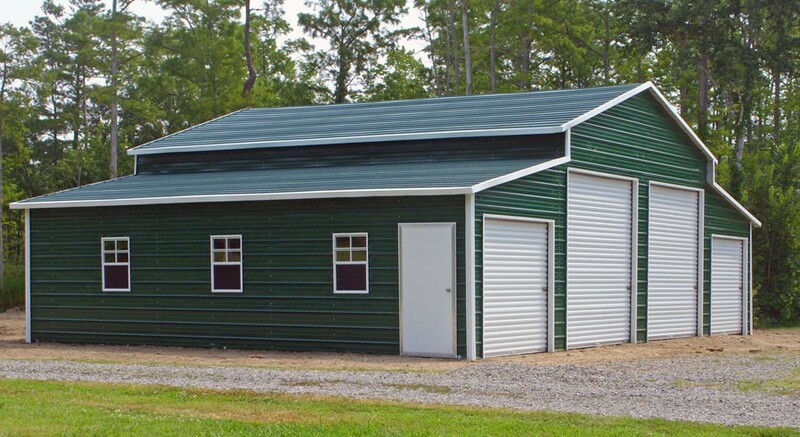 Pole barn garages are also extremely easy to build, even if you have little or no experience. In fact, most people choose to buy kits and build the garage themselves – that’s how easy it is to build a pole barn structure. With conventional structures, wind, rain, sleet and snow push directly against the garage’s load-bearing walls. Over time or with extreme weather, the structure may become damaged or destroyed. With a pole barn garage, the embedded poles transmit some of the force into the earth, which minimizes the impact. You want a garage, but you don’t want to break the bank just to build one. The great thing about pole barns is that they’re extremely affordable. And if you choose to build the structure yourself, you can save on labor, foundation, equipment and materials costs. You’re sold on the benefits of a pole barn structure, but you’re not sure how to get started. What should you look for when buying a kit? There are many pole barn kits for sale online, but not all of them are created equal. We’re going to share some of the most important factors to consider, but first, there are some things that you need to do before you even start shopping. Because pole barn structures do not require a solid foundation, people mistakenly assume that they can be placed and moved wherever and whenever. But in order for the garage to be structurally sound, the poles need to be embedded deep into the ground. In other words, once the structure is built, you won’t be able to move it (not easily). Make sure you know exactly where you want the garage to be built before you even start shopping for kits. Once you’ve found the ideal location, you can determine what size structure you’ll need. Pole barn kits are relatively inexpensive compared to the cost of a stick-built structure, but you still need to set a budget. Expect to spend at least a few thousand dollars for a quality kit and materials. Pole barn prices can vary significantly, so choose a price range that you can realistically afford. You’ll also want to consider local zoning regulations and find out whether you need a permit to build your pole barn garage. In most cases, pole barn kits come with all the materials you need to build the structure. But the quality of the materials will vary depending on the company. The best kits come with the best quality materials, including premium lumber, metal roofing, wood trusses that are code-compliant, and siding. Quality kits also come with color-matching fasteners and trim as well as doors and windows (if applicable). Before buying a kit, make sure that you get a construction outline as well as a blueprint to streamline the process. The only thing you should need to supply are the tools – and the labor. Pole barn structures offer a few different types of flooring. The right one for you will depend on your needs and uses for the garage. Gravel and dirt floors are the least expensive option, but may not be a practical choice if you’ll be working in your garage or using it for storage. These two types of flooring also require annual maintenance, which can wind up costing you more in the long run. Concrete is the most costly option, but is virtually maintenance-free and will last for a very long time. We discussed the importance of setting a budget earlier, and you’ll need to consider the cost of the kit you’re considering. While an important factor, cost shouldn’t be the only thing you consider. Remember – cheaper isn’t always better. Quality kits come at a higher price because they include high-quality materials. Low-cost pole barn kits, which may be inferior in quality, may cost you more in the long run due to repair or replacement costs. If you plan on hiring a professional to install your garage, you’ll need to factor in these costs as well. Just like with the kits themselves, the cost of the professional’s service is often a reflection of the value they provide. And do your research to learn more about the company’s or individual’s reputation. Building a pole barn garage isn’t a huge undertaking, but you still want to ensure that you work with a reputable company. Pole barn kits typically come in a wide range of colors, and many offer a variety of customizable features. If you have a vision for your garage or certain requirements, look for a kit that offers the options you want or need. Another important consideration is the style of the barn and any other extras that may be offered. If you want windows in your garage, make sure you choose a kit that offers them. Many kits also offer skylights and other features that you may want. Doors are another consideration. A wide variety of styles and materials are available, and you can have both overhead and conventional doors on your garage. The style and design is ultimately up to you when buying a kit. You can make your garage look however you please with the customization options available. And if you want a certain feature or style, you can contact the manufacturer to see if they can accommodate your needs. In many cases, they can. There are many things to consider when choosing a pole barn kit, but these are the most important factors. Again, make sure that you find out what the permit requirements are (if any), and look for a quality kit from a reputable manufacturer. And if you plan on hiring someone to install it for you, do your research to find someone who will charge you a fair price and provide you with quality work. In most cases, you’re better off paying a higher price that includes higher quality materials and everything you need to get your structure built quickly and safely. 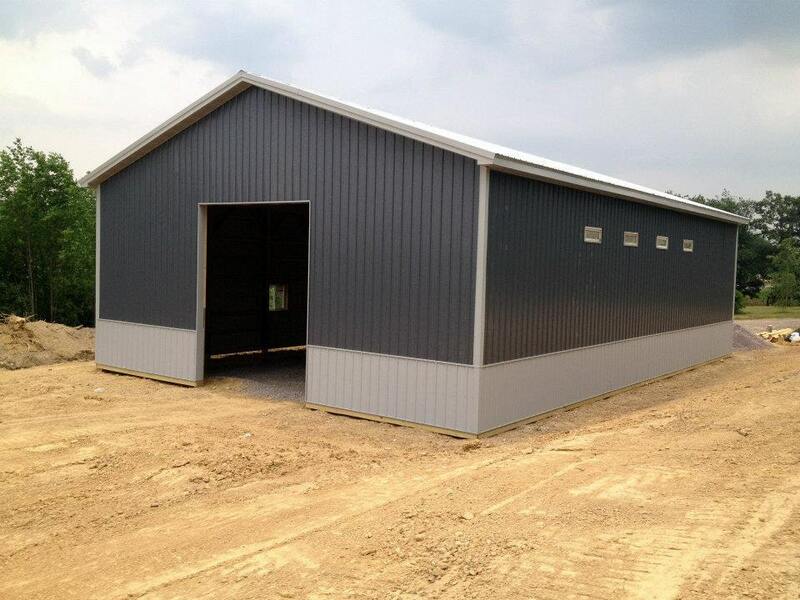 If you’re looking to build your own custom pole barn garage, we offer a free estimate below. This free estimate will give you an idea of how much your new structure will cost. Here’s a hint: It will be far lower than the cost of a stick-built garage.